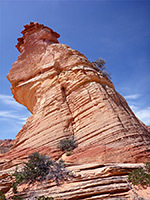 The permit area for South Coyote Buttes covers the southernmost 3.5 miles of the Coyote Buttes ridge, approximately as far north as Top Rock Spring, and extending east to incorporate a wide area around Cottonwood Cove and Cottonwood Spring, this latter where most of the photogenic formations are found. 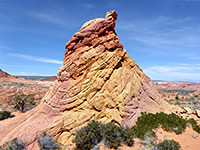 The ridge itself, uniformly colored deep red, contains a few hidden arches and other jagged formations, but this region is very little explored and in many places the slopes are too steep to traverse; instead, the permitted visitors (limited to 20 per day), usually just see the easternmost region, south of Cottonwood Spring. 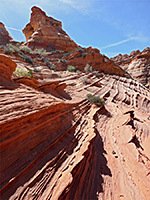 Over an approximately circular area, half a mile across, the thin-layered, cross-bedded Navajo sandstone bedrock is eroded into a great array of cones, hoodoos, fins, ridges and ravines, along the east rim of the wide, sandy valley extending north from Cottonwood Cove, the far side of which slopes up much more steeply to the Coyote Buttes ridge. The rocks exhibit a great range of colors, due to oxidized iron compounds - mostly reds, pinks, yellows and oranges, and the individual strata vary in hardness, resulting in amazingly varied erosional patterns. 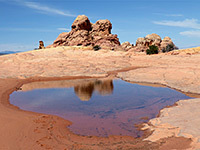 Occasional rainwater pools add to the beauty of the scenery. The place is relatively easy to explore, since the majority of the ground is firm rock, largely lacking vegetation, separated by just a few sandier patches, and most parts have gentle relief, though the ground does slope down quite sharply to the west, dropping up to 300 feet to the valley floor. Some Southwest erosional landscapes require patience when exploring, to find the best places and angles, but here almost every cone and gully is worthy of a photograph. 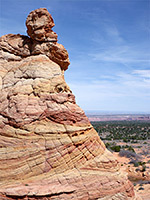 The edge of the formations is half a mile from the closest parking place, along a sandy 4WD track, and much can be seen in a circular walk of just a mile or so, but to cover all of the area, extending to a dispersed group of teepees on the far side of the valley, entails a round trip of up to five miles. Formations east of Cottonwood Cove. Full screen version (22 mb). 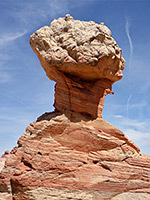 The Cottonwood Cove area of South Coyote Buttes can be reached by cross-country hiking starting directly along House Rock Valley Road - first following a tributary of Coyote Wash then climbing right over the Coyote Buttes ridgeline and descending towards Cottonwood Spring - though the route is not very easy. The road is accessible to 2WD vehicles, however, unless soon after rainfall, unlike the normal vehicular route to the formations, which always requires 4WD. The road is stony for the first few miles, up to a pass and down to the Buckskin trailhead, then generally better up to the Wire Pass trailhead after 6 miles; after here the surface is more clayish, and liable to be rutted even when dry. The shortest way to reach Cottonwood Cove is to leave the road near Lone Tree Reservoir (16.4 miles south of US 89), heading east along a lesser track, soon forking north and passing Paw Hole (a seasonal pool) after 2.6 miles, below the very southern edge of the Buttes, and continuing to another junction at Poverty Flat (5.7 miles), site of a ruined ranch. Some sections towards the end of this track have especially deep, soft sand, so for less rugged vehicles a longer though firmer route is recommended, leaving House Rock Valley Road 3.8 miles further south on another track, through several junctions and also reaching Poverty Flat, after 9 miles. 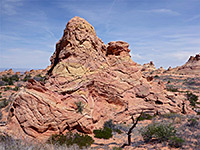 From the Flat, a reasonably firm track heads north for 2.2 miles, to a parking area just beyond an old, circular corral, from where the Cottonwood Cove formations can be seen to the northwest, across half a mile of bushy, sandy ground. 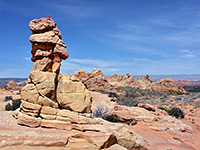 A smaller group of red and white rocks a quarter mile northeast also invites exploration. Paw Hole is also the location of a secondary trailhead, and from here the formations can be reached by a one-way hike of around 3 miles. 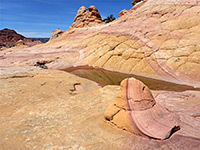 The north edge of the Cottonwood Cove formations is formed of a reddish outcrop, extending south to join a larger patch of lighter-colored sandstone, centered on an enclosed bowl with a wave-like gully at the entrance, on the north side. The slopes above are too steep to climb over, but most places can be seen by walking inside the basin and all around the perimeter; on the outer slopes are lots of other wavy passages and thin-layered formations, some colored particularly dark shades of red and purple. A few places harbor tiny seeps, and sometimes shallow pools. A short distance south, beyond a sandier interlude, and slightly higher in elevation, is the most visited area, closest to the trailhead. The rocks exhibit even more color variation, generally lighter in hue - pale pink, pale yellow and white are the predominant shades. Sizeable patches are entirely bare rock, dotted with small pinnacles amongst the higher groups of cones. The band of the best formations extends a third of a mile south to a wider flat area, site of several larger (seasonal) pools, then to the southwest is another, slightly lower relief area, containing small narrow pinnacles in addition to the usual broader cones and teepees. The sandstone hereabouts is in places noticeably distorted, in contrast to the more usual angular strata elsewhere, and still further west are a line of even more convoluted, deformed rocks including some head-shaped hoodoos, mostly colored white and yellow-brown. This area is at the rim of the valley, above a steep, layered slope that becomes dark red lower down. 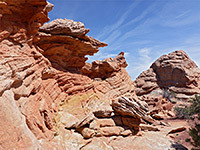 This rocky escarpment continues one mile southwest to the head of the cove, but the more distant formations appear less interesting in shape, and uniformly red in color. There is one other photogenic group, to the northwest, on the far side of the usually dry wash that runs down the valley floor - about a quarter of a mile west of Cottonwood Spring, which is only a transient water source though the land close by is sufficiently moist to support a few large cottonwood trees. 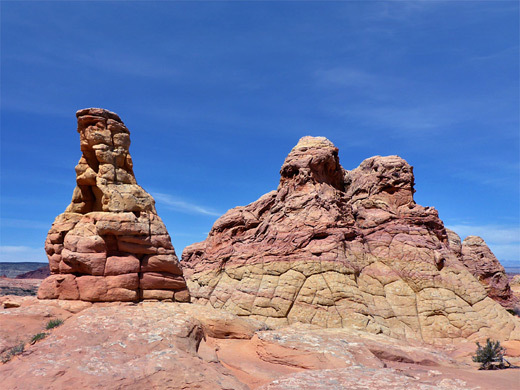 Here are found a few pretty, isolated, light-colored formations, some quite tall, transitioning to a band of smaller, reddish teepees composed of relatively thick bands of rock.